The Benro BVX Carbon Fiber Video Tripod Kit with BVX16H Head is a heavy-duty tripod system designed to provide a flexible workflow for on-the-go operators with large camera rigs. The included fluid head supports up to 35 lb and features 6 steps of counterbalance, 6-speed pan and tilt dampening, and a snap-in quick release camera plate system. A small camera plate is included that can conveniently be attached to large baseplates and then be inserted with an entire camera load into the integrated quick release platform. This efficient system provides an easy way of mounting large camera rigs. The integrated platform can then be adjusted forward and backward to find the center of gravity. 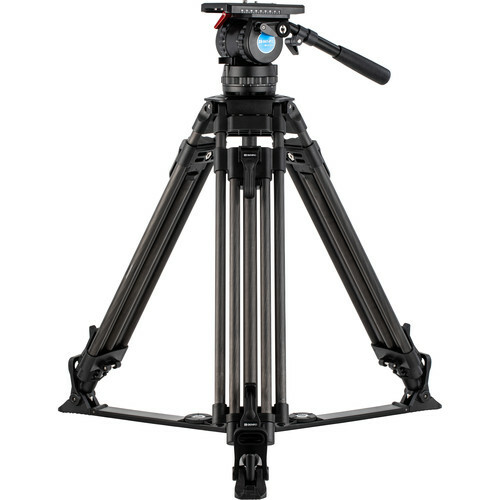 The tripod legs feature a 100mm bowl and 2-stage design with dual tandem upper-leg section for better stability. The legs have flip lock levers that are designed oversized so they can be easy to handle, even with gloves. The lower-stage levers have an additional lip so that you can easily open and close them with your foot, and this allows you to make adjustments on the fly while still standing behind the camera—just kick open the lever and pull up the tripod to adjust the height. The legs have large footpads to provide better stability on smooth surfaces, and these are removable to reveal dual spikes for extra stability on soft ground. The kit is complete with an adjustable ground spreader, telescoping pan arm, and padded carrying case. Box Dimensions (LxWxH) 43.5 x 11.0 x 11.0"